A good tailor can make or break your outfit. When you’re trying to choose a great tailor, chances are your wardrobe piece is especially important to you. The chances of your clothing being ruined from a bad tailor are more than you want to take. This is why we highly recommend you do a little work before taking in your favorite jeans, suit, or wedding dress to get altered. 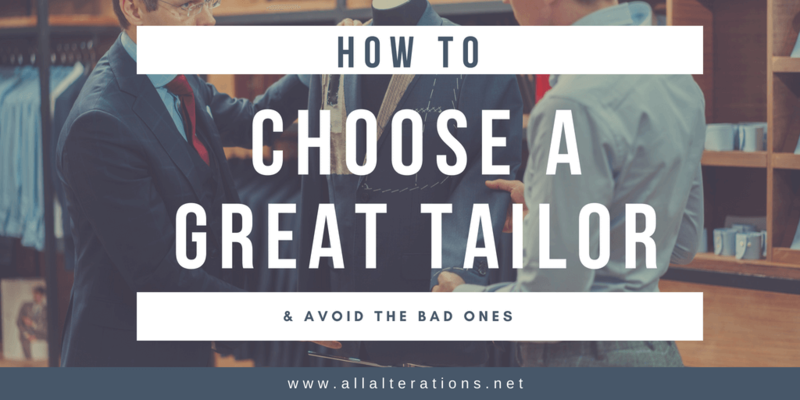 Follow our tips below to choose a great tailor. Look at online reviews on Google, Yelp, and the tailor’s Facebook page. Then, take it a step further. This article on Esquire recommends asking local formalwear stores which might have better insight than online reviewers. Have a particularly stylish friend? Ask them where they take their clothes to get fitted. When checking online reviews, take them with a grain of salt. One negative review in the mix of a lot of positive reviews can usually be ignored. If there are several bad reviews from the same person, that can usually be overlooked as well. If several people have given thoughtful negative reviews, look elsewhere when you are ready to choose a great tailor. If you live in a bigger city, you will probably have a number of highly-recommended tailors near you. Maybe it comes down to two to three options. Either way, after you’ve done your research, you need to narrow down your options. What are you looking to have tailored? Are you bringing in your Armani suit, bridesmaid’s dress, or jeans? 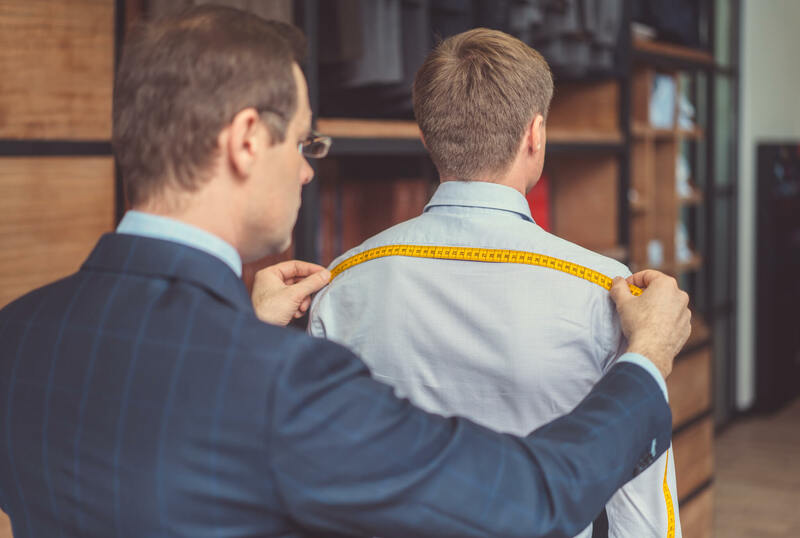 Check out the tailor’s website, Facebook page, and/or Google business listing and make sure they are experienced in the type of alterations you need. You wouldn’t take your wedding dress to be altered at a shop that specializes in men’s suits, right? You have picked out the best options for you, now give them a call. No, really. It may seem over the top, but a quick conversation with the business will tell you a lot. The Art of Manliness recommends this for several reasons. First, you are checking to make sure the shop can do the type of alteration you’re looking for. Second, you’re checking the tailor’s customer service level. If you have a pleasant conversation and it seems they are capable and experienced, you know you will enjoy bringing your pieces here regularly. On the other hand, if the tailor or staff seems irritable or unable to communicate well, consider if you will want to deal with that kind of service every time you need an alteration. Chances are, you won’t! If giving your tailor candidates a call was a bit much for you, this is taking it a few steps further. However, it’s important to have these details sorted out, especially if they are working on really important and expensive clothing. Check guarantees and damage policies. You want to see in writing the policies the shop adheres to if and when an alteration goes awry. Commonly, your piece isn’t perfect after the first alteration. “You want a place that considers the job ‘done’ when you’re satisfied with the fit – even if that takes two or three rounds of alterations,” according to The Art of Manliness. This makes sense, why keep paying the same fee over and over to get your clothes fitting right? Second, you want to have some sort of compensation should the alteration ruin your clothing. Accidents happen and even to the best tailors. Look for a guarantee that replaces your piece at actual cost and not an adjusted value! Other details to check out include turnaround times and price. For simple alterations, you can expect anywhere from 2-3 days to a week or so. Better tailors are usually in high demand and this can impact turnaround time, but that’s what you are looking for! Larger and more involved projects can take a few months. Finally, when checking price, keep in mind a good tailor is worth it. However, if several tailors are all charging roughly the same amount, but one similar tailor is charging several times more, you might be better off going to a tailor that falls within a similar price range. Again, this may seem like overkill, but a good tailor will be happy to show off their work. Check to see the hems are clean and consistent, the fit is clean and the garment falls like it should, and that the work is high quality. Then, bring in an item that you wouldn’t mind being ruined. Make it similar to the item you ultimately want tailored. This will save you a substantial amount of regret and headache later down the road. You’ve gone through all the other steps to find a great tailor, right? We welcome you to look us up and do your research on our shop. Bring your piece by the shop and we will be happy to answer your questions and show you examples of our work. At All Alterations, we strive to provide the highest level of service and alterations. This includes meeting the marks for all the criteria listed above. We are confident that after you follow the steps to find a great tailor in the Charleston area, you will find yourself at our door. 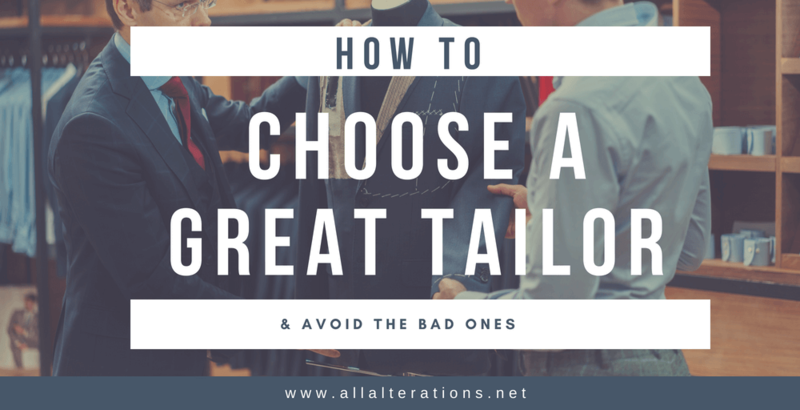 When you need to choose a great tailor, look no further than All Alterations!